You know it’s going to be a great Date Night when you eat dessert first! Really? You want more after that opening line? Okay that’s what we are here for! It’s always exciting when you have time and a new area to explore. We make the short 2.5 mile jaunt from work to Inman Park for the evening. Due to the generosity of a co-worker we end up with some extra time before our 5:45 dinner reservation and we use it to really explore and enjoy the area. Early in our stroll, the word chocolate – with the second line: sweets, ice cream, drinks – catches Roger’s eye! Around the corner lurks a chocolate paradise. This warrants a full investigation, at the very least we need to know how late they are open so we can make dessert plans! The Cacao Laboratoire closes at 6. We are drooling over “in store made” “bean to bar” confections. The entire place is filled with the sweet aroma of fresh chocolate. (As an aside, we visited Hershey, PA this past summer and nothing there smelled like chocolate!) Amazing truffles and holiday specific treats seem to be the specialty (there are artisan Easter bunnies and eggs available). What would you do? Its 4pm, and we have dessert! 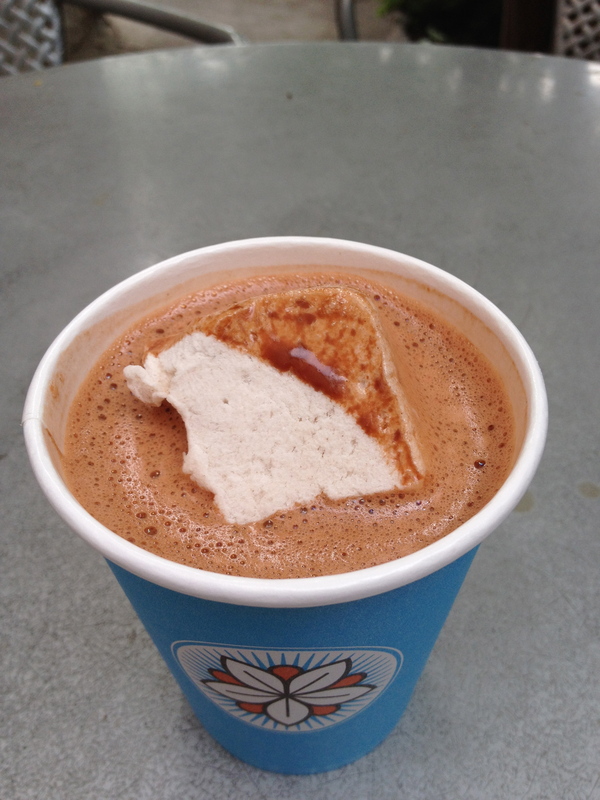 We order a hot chocolate, which comes with a house-made marshmallow. Expensive, but worth every cent. Eight ounces cost $6.50–that’s $104 a gallon! It’s small, but incredibly rich. It’s not really sweet–closer to the italian style, but extremely smooth and flavorful. 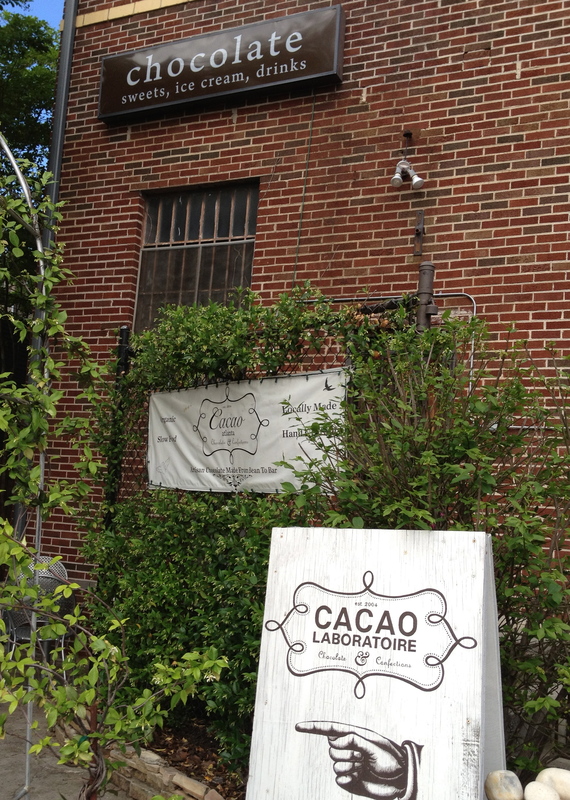 We have a little chocolate buzz going and we are off to walk around Inman Park. We have a “Mad Men” moment while visiting a vintage 60’s furniture store, and then a “Hoarders” moment as we walk through a tightly packed “antique” (you can call it junk) storefront attached to a much nicer gift shop. We end up in the Barcelona Bar for our next course. It’s a beautiful wine bar with a crack staff and a fairly decent beer list. 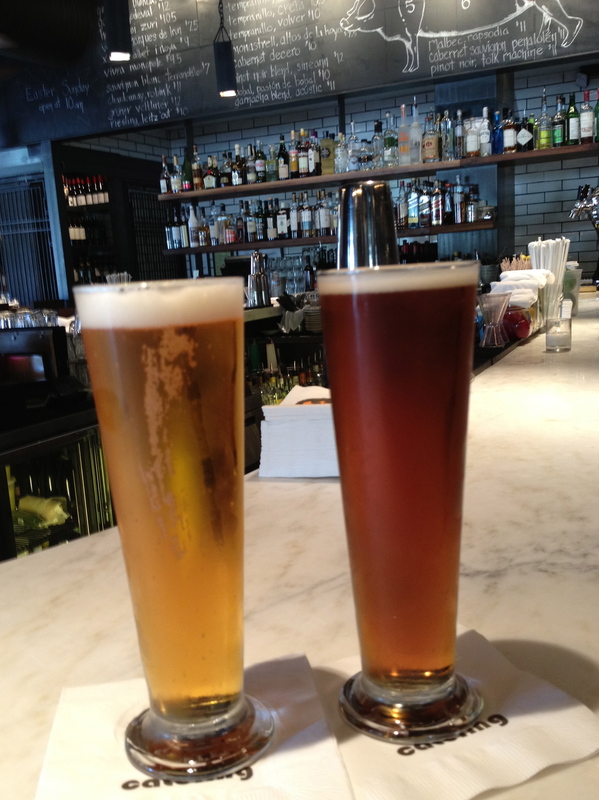 We choose the Leffe Abbey Ale and Spaten Oktoberfest lager. Belgium on the left vs. Germany on the right. The Belgian was better this time. Tapas is the specialty here and we are torn between ordering something or saving our appetites for dinner. 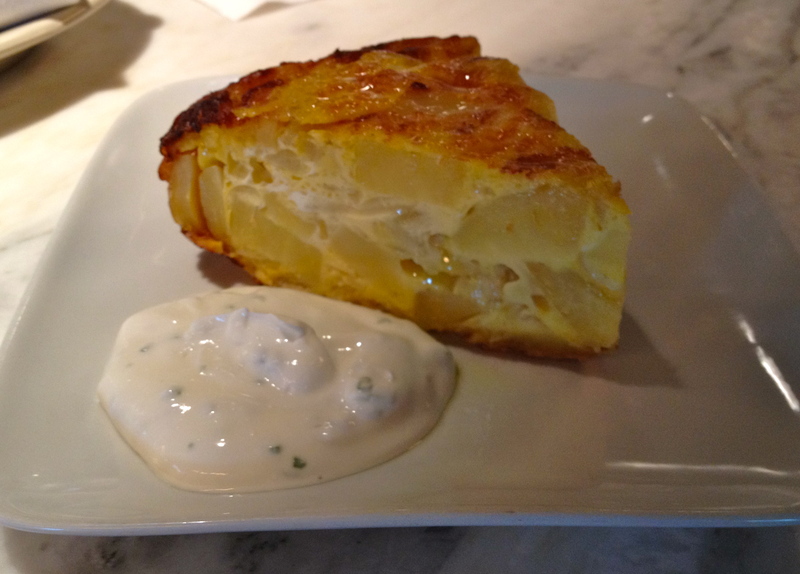 The Potato Tortilla. This is the display model at the cheese bar. While we are enjoying our beers and admiring the displayed foods, Roger strikes up a conversation with the manager about some of the tapas, which results in the delivery of a complimentary serving of the Potato Tortilla. Is Date Night so famous now that we are getting free food? We think not! 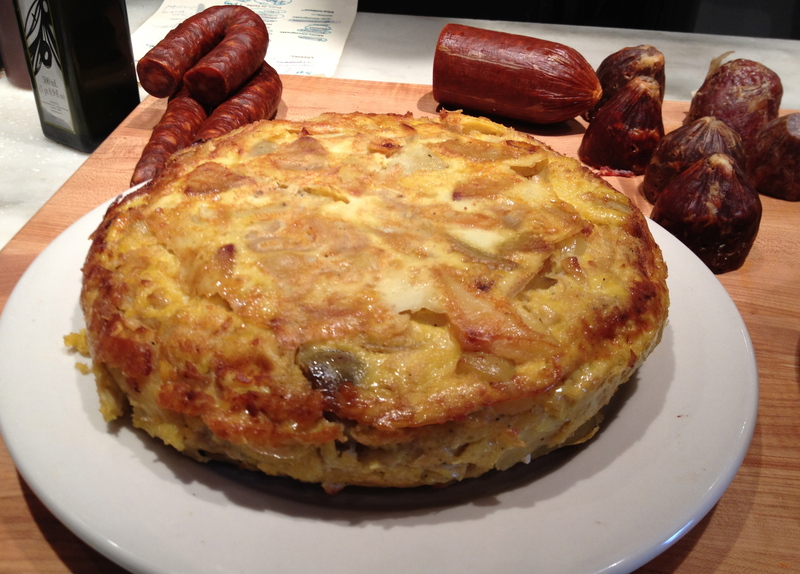 The Potato Tortilla served up. It's a big slice, perfect for sharing. The decision has been made for us, and we really enjoy it. We linger at the bar (while it fills up) so long that we are almost late for our dinner reservation across the street. Our third and final Inman Park destination is Sotto Sotto. Like No. 246 from last week’s Date Night, it’s another place where you sit so close, you can become best friends with your neighbors before you finish the meal. After Eve lends her reading glasses to the gentleman sitting to our left, we have new friends and enjoy chatting with our table mates throughout our meals! “Sotto squared” is Italian food, featuring pastas and wood-grilled meats from their wood-fired oven. Next door is Fritti, the more casual of the two, which has pizza and sandwiches. We start with some big Italian wines, a Chianti Classico and a Super Tuscan. 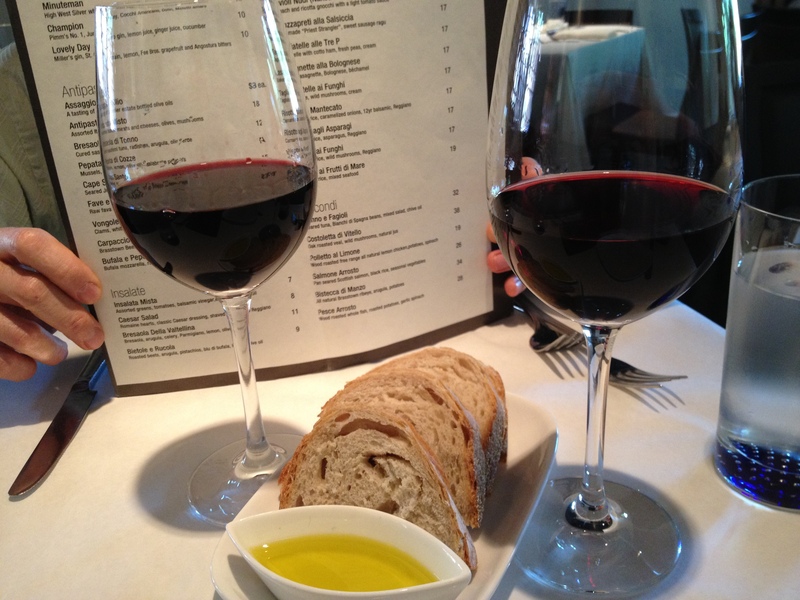 A Super Tuscan and a Chianti. The bread and oil was really good too. 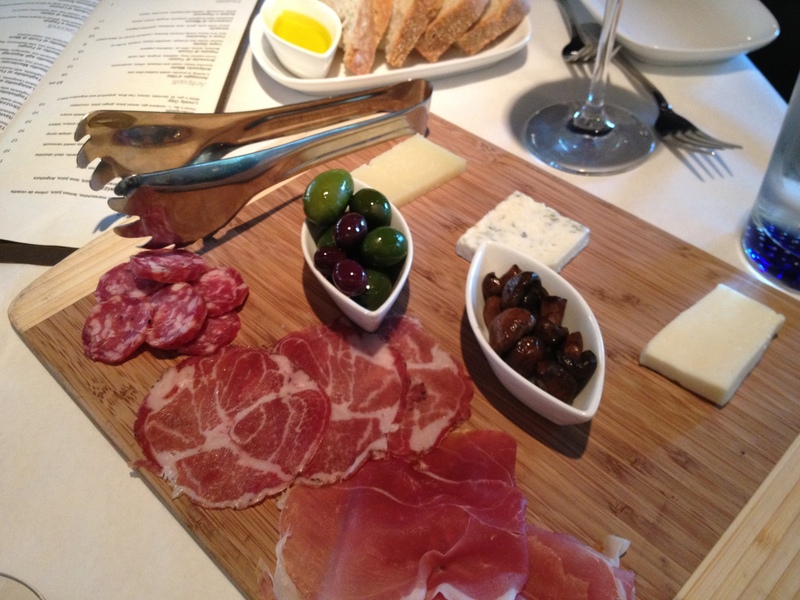 Even though we have had an appetizer, the thought of the antipasti misti is too good to resist. A little of this, a little of that and a lot of good flavors. The plate comes with three meats and three cheeses. We get nice slices of pecorino, Gorgonzola and taleggio on the cheese side. The meats are boar sausage, prosciutto, and capicola salami. There are also olives and mushrooms on the platter. The pecorino and boar sausage are the favorites on this plate, but everything tastes wonderful. We are pretty full, so we decide to split the seafood risotto. There is plenty for sharing and the plate is full of shrimp, clams, mussels, and calamari. The chef did a wonderful job on this dish and it was a great combination of the fruits of the sea. 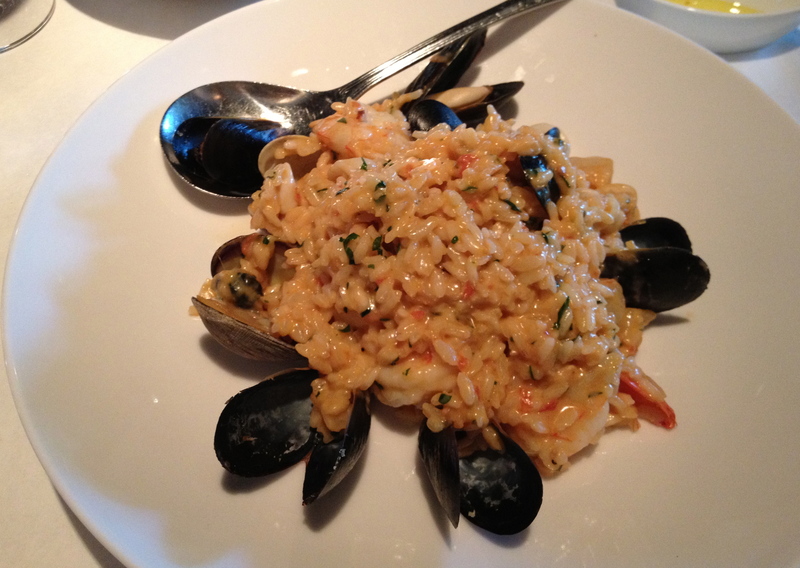 The main attraction: seafood risotto. In case you were wondering, the people at the table next to us got a pasta dish and a veal chop, which was huge (as was the price since it was the most expensive thing on the menu). He said he was going to eat only half of it, but he ate the whole thing. We felt a little funny taking pictures of other people’s food, so no pictures of that veal chop will appear on this blog. Did we have room for dessert? No way! Besides, we started our culinary journey with dessert first. We really enjoyed our Inman Park Experience and have targeted more places to hit on future Date Nights. Stay tuned for more from this section of town.